Andalucia is an excellent destination for those who are truly interested in good food, and guests at our villa will want to sample as much as possible! In Andalucia the emphasis is on the freshest of ingredients, simply prepared so that the quality can be really appreciated. The Mediterranean diet, with its emphasis on fresh fruit and vegetables, exquisite seafood and extra-virgin olive oil is one of the healthiest in the world. In addition, what really makes eating out in Andalucia different from anywhere else is the sheer enjoyment and informality that prevails in the restaurants and bars. Here you will find no hushed silences or pretentious surroundings, just family and friends enjoying each others' company. Children are welcome everywhere, even in the smartest of restaurants. The staff are always happy to prepare something special for their youngest guests. Andalucian children stay up as late as their parents, particularly in the summer, and they learn to appreciate good food at an early age. So spend some time in the local village of Humilladero while staying at out luxury villa in Andalucia - your children will love it too! Everyone is familiar with paella, that classic of Spanish cooking, but properly made with Spanish short-grain rice, saffron, and the freshest of seafood it is an unforgettable experience. Gazpacho is also well known, but have you tried the Antequeran porra, a thicker type of Gazpacho with a garnish of Serrano ham? Moorish spices are heavily used in Andalucian cooking - a reminder of Andalucia's Arab past - and they add a delicious but subtle touch to meat dishes, from pinchitos (small kebabs) to casseroles. Most meat is simply prepared on the grill or barbecue, flavoured only with olive oil and garlic. A favourite with children is always pollo al ajillo - tiny pieces of chicken cooked with lots of garlic and olive oil with bread to soak up the juices. 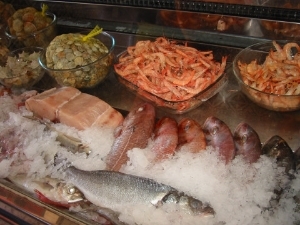 It would take more space than we have to describe the variety of fish and seafood available in the restaurants of Andalucia. The city of Malaga in particular is famous for its delicious fried fish. Malaga is a wonderful day trip from our Andalucia villa and is the quintessential Andalucian city! Choose the fritura malagueña for a variety of fried fresh fish. Most frequently encountered is hake (merluza) served fried or grilled or cooked with clams, garlic and parsley. Depending on what has been caught that day you will also find sole, cod, sea bass, bream and many others whose names you cannot translate! Two favourites with children are small pieces of Rosada (a firm white fish) crisply fried in a light batter and served with Ali-oli, a very garlicky mayonnaise and Cazón en Adobo ( a kind of shark!) cut into small pieces and marinated before being fried. You will not find buttery or creamy sauces often as generally the Spanish believe that the flavour of truly fresh fish should not be obscured! 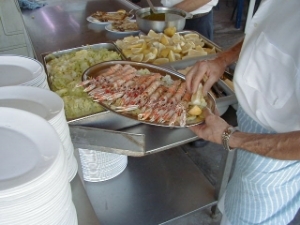 Seafood aficionados will find prawns of every size from tiny to gigantic, together with langoustines, crayfish and lobster. Most villa guests arrive determined to sample the many tapas available in the bars and restaurants. One notable thing about the tapas in Humilladero is that they are included in the price of your drink, something which has all but vanished in coastal resorts. Tapas can be either hot or cold. The choice of cold tapas will often include a piece of delicious manchego cheese or Serrano ham, a tiny plate of seafood salad or some pipirrana- a refreshing salad made with finely diced peppers and tomatoes and of course a piece of the famous Spanish omelette. But most memorable are the hot tapas. It could be a tiny piece of fried fish served with some perfectly dressed salad leaves, or a couple of grilled prawns or fried fresh anchovies. All kinds of little sausages are served as tapas, notably the spicy chorizo and morcilla ( a kind of black pudding). You might also try a miniature casserole of pork cooked in a fresh tomato sauce or with Moorish spices and served in a tiny earthenware dish. Small pieces of steak also feature as tapas, either served on their own or inside tiny buns. One or two meatballs (albondigas) or chicken wings (alitas) are also popular with children. This is only a fraction of the tapas available as every bar has its own unique specialities and at some, particularly in Antequera, just 20 minutes' drive from our Andalucia villa, you can choose from more than 20 different tapas!